He was OK with the move, because he has pitched up until college, but he didn’t really know how to pitch. He knew how to throw hard, and that was it. It took Parker parts of five years in the minors, before he got his first taste of the majors in 2012, just shy of his 27th birthday. He spent much of 2013 in the big leagues, and posted a 2.72 ERA in 49 games with the Cubs. The next season wasn’t quite as good, and he bounced between the majors and Triple-A. And in 2015, he pitched through pain all spring, trying to make the big league club, before finally succumbing to surgery to clean out bone chips. It wasn’t until spring of 2016, with the Seattle Mariners, that he finally felt strong again. He had a 2.72 ERA and 19 saves as the closer at Triple-A. He got a brief call-up to the majors, but he was then out of options, so the Mariners had to designate him for assignment when they needed to clear a roster spot. The Yankees claimed him and he finished the season with New York. The Angels claimed Parker on waivers from the Yankees in October. Then the Milwaukee Brewers claimed him from the Angels in November. Then the Angels claimed him back from the Brewers in December. Then the Angels designated him again in January to make room for Luis Valbuena, but this time he cleared waivers and stayed with the organization. What they saw was a pitcher whose stuff has been gradually improving. His average fastball in 2014, before the elbow trouble, was 91.5 mph. Last season, it was 92.24. So far this season, it’s been 93.74. Parker said it’s just a matter of more years knowing how to pitch, plus more time passed since his surgery. Entering 2017, Parked had been something like an average pitcher over a small number of innings, but he was outstanding in spring training when he struck out 24 batters in 12.1 innings while walking only two. And he’s kept it going into the regular season. More strikeouts, fewer walks, fewer home runs, and way more ground balls. Unsurprisingly, the results have followed whether you look at ERA, FIP, DRA, or anything else. And while the home-run rate is almost surely a bit of a small-sample aberration, the strikeout rate is well supported by a much lower contact rate despite the same number of swings. There are usually two obvious factors to look for when a reliever goes gangbusters, and Parker checks both boxes. First, he’s changed his pitch mix, shifting away from the curveball and toward the splitter. There aren’t any obvious signs that his splitter is much different than it has been in previous seasons, but it certainly appears to be a useful pitch. It might be the case that his arsenal is more effective when it’s mostly fastball-splitter rather than fastball-curveball, and at this point he’s throwing more splitters than almost anyone else in the league. Additionally, his fastball velocity is way up. I’m not a scout, but in watching a number of his outings over the last couple of seasons, I didn’t immediately notice him doing anything different in terms of his delivery that would lead to an increase in fastball velocity. No one in the game with whom I spoke about Parker had an explanation for where he found the velocity, such as an arm-slot change or a new training regiment. Parker’s story reads a little more improbably than it actually should. He’s a 32-year-old reliever having a breakout season just two years after have elbow surgery. It’s not quite Jim Morris making the Rays, but the first few lines grab your attention. But it’s not uncommon for good relievers to appear seemingly out of nowhere. It happens all the time. The difference between mediocre and great in the bullpen is often quite small. It might only take a slightly new grip or an altered arm slot to rejuvenate a pitcher’s career. Parker wasn’t bad at all prior to 2017, but he was late to the party because he got his start as a catcher and had to methodically climb his way through the minors. And when he arrived he performed ably, but didn’t do anything remarkable and eventually ran into some injuries that kept him out for most of 2015. In a league that’s skewing younger, Parker is establishing himself late, but there’s no reason to think it’s any less real than 35 great innings from someone eight years his junior. Velocity isn’t something you can fake, and a quality splitter which he can throw for strikes gives him a real shot to get lefties out in addition to righties. He’s allowed just one run in 22.1 innings since getting knocked around on May 3. 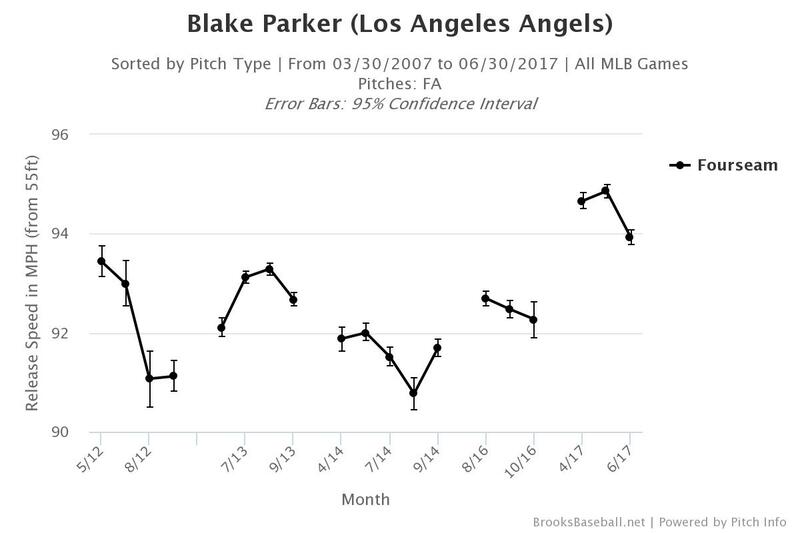 Parker will likely allow home runs more often as the season moves forward, but the fact that some of that suppression is coming because he’s keeping the ball on the ground and allowing less contact, there’s no obvious reason why he shouldn’t generally be able to maintain a high level of performance. He’s never been tested with the workload of a high-leverage reliever, but he’s about to be. The degree to which he can stay healthy is going to dictate a lot about how the Angels see themselves at the deadline and down the stretch. We hoped you liked reading The New Relief Ace in Anaheim by Neil Weinberg! Finally, some love! This is the year of former Yankee RP’s. I cant, its just too easy.